Trigger point injection (TPI) may be an option in treating pain for some patients. TPI is a procedure used to treat painful areas of muscle that contain trigger points, or knots of muscle that form when muscles do not relax. Many times, such knots can be felt under the skin. Trigger points may irritate the nerves around them and cause referred pain, or pain that is felt in another part of the body. The Trigger Point Injections in our office are performed by a nurse practitioner or a Physicians Assistant under the supervision of a Medical Doctor or by the M.D. him/herself. While in the same building as Picard Chiropractic both maintain separate affiliations. What Happens During Trigger Point Injection? 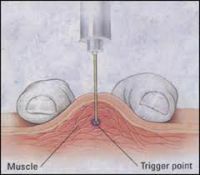 In the TPI procedure, a health care professional inserts a small needle into the patient's trigger point. The injection contains a local anesthetic such as lidocaine followed up with injections of a homeopathic anti-inflammatory called traumeel. Some offices may inject steroids such as Cortisone. We do not. 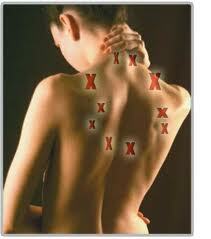 With the injection, the trigger point is made inactive and the pain is alleviated. Usually, a brief course of treatment will result in sustained relief. Injections usually take just a few minutes. Several sites may be injected in one visit. If a patient has an allergy, saline or a dry-needle technique (involving no medications) can be used. A complete history and examination is performed prior to treatment. TPI is used to treat many muscle groups, especially those in the arms, legs, lower back, and neck. In addition, TPI can be used to treat fibromyalgia and tension headaches. TPI also is used to alleviate myofascial pain syndrome (chronic pain involving tissue that surrounds muscle) that does not respond to other treatments.